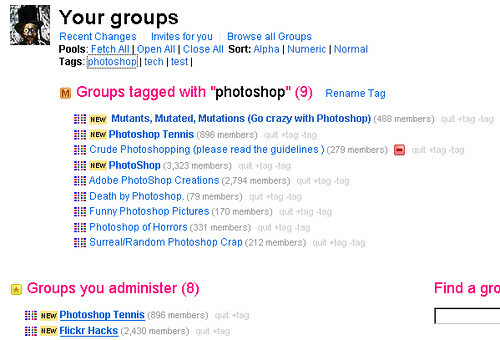 I finally got round to updating my Flickr Groups Organiser greasemonkey script. It now works fine with the latest version of Greasemonkey and also the latest Firefox. Ive also modified the script, so the “quit group” links only show up if you click the “show quit links” link at the top of the groups list page. I did this as it was sometimes possible to accidentally click on the quit groups links by mistake, now they only show up if you actually enable them. The updated script and all my other flickr greasemonkey scripts are available here: http://steeev.freehostia.com/flickr/ as usual. This entry was posted on Tuesday, June 17th, 2008 at 9:49 AM	and is filed under firefox, flickr, greasemonkey, programming. You can follow any responses to this entry through the RSS 2.0 feed. Both comments and pings are currently closed.